Fourteen years after the United States declared "war on terrorism," there's no victory in sight. In fact, the toll in blood and treasure is as bad as ever. This is according to the latest figures from the latest Global Terrorism Index, released on Tuesday by the Institute for Economics and Peace (IEP). Drawing on data from the University of Maryland's National Consortium for the Study of Terrorism and Responses to Terrorism (START), the index finds that the cost of terrorism in lives lost and dollars spent reached "an all-time peak" in 2014. The numbers speak for themselves: 32,658 people were killed by terrorism last year compared to 18,111 in 2013 — an unprecedented jump of 80 percent. Overall, deaths have increased nearly ninefold since 2000. The estimated cost of the devastation has been $52.9 billion — a tenfold increase over the past decade. Dr. Erin Miller, the manager of the the Global Terrorism Database at the University of Maryland, said that the big upswing in incidents is linked to a worldwide proliferation of conflicts involving non-state actors. "The data is really regionally specific," she explained. "So when we say an 80 percent increase worldwide, we have to say it's concentrated in a few organizations in certain parts of the world." Indeed, the IEP report shows that the self-declared Islamic State (IS) and the Nigerian group Boko Haram are responsible for a full 51 percent of deaths in claimed terror attacks. Killings linked to terrorism in Afghanistan, Iraq, Nigeria, Pakistan, and Syria accounted for nearly 78 percent of all terror-related deaths in 2014. Iraq still topped the charts with the most deaths: 9,929 last year, the highest ever recorded in a single country. Nigeria experienced the single biggest upswing in terror activity, with related deaths tripling since 2013. But this increase can be seen around the globe. The number of countries with 500 deaths or more doubled, increasing from five in 2013 to 11 in 2014. "The significant increase in terrorist activity has meant that its ramifications are being felt more widely throughout the world," said Steve Killelea, executive chairman of IEP. This spread is particularly interesting given the lack of a single root cause that can be blamed for the phenomenon. "What is most striking from our analysis is how the drivers of terrorism differ between more and less developed countries," Killelea explained. "In the West, socio-economic factors such as youth unemployment and drug crime correlate with terrorism. In non-OECD countries, terrorism shows stronger associations with ongoing conflict, corruption, and violence." But Miller at the University of Maryland cautions against reading too much into the numbers. Her team collects data using open-source media reports. With a marked increase in reporting on terrorism over the past decade, there's no way to know for sure if the data reflects a spike in the total number of deaths or merely an increase in those that are reported. What's more, it sometimes isn't easy to differentiate between a death caused by terrorism and, say, a death caused by a Syrian army barrel bomb. "The line between 'insurgency' and 'terrorism' isn't always the most clear," Miller said. She and her team make a point of being conservative in their estimates. "In Syria, for example, we vet our sources and are very careful about documenting incidents," she noted. 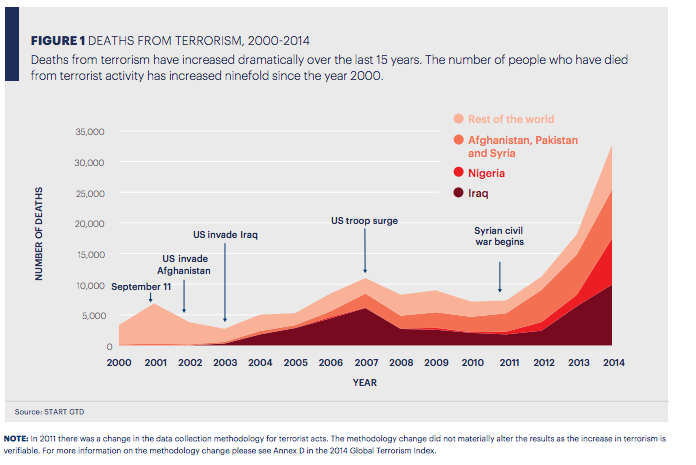 The Global Terrorism Index also includes careful analysis of the cost of terrorism. The figure of $52.9 billion in economic harm this past year reflects property damage, medical expenses, and lost earnings. The sum does not factor in the resources spent fighting terrorism, which increased by 61 percent from 2013 and 2014. In the aftermath of Friday's deadly terror attacks in Paris, it seems all but certain that this unfortunate trend will continue.